Hi Kittens! It’s me, Kitty Powers! I’m here with fabulous news! We’ve got a brand new game mode - Yay or Nay! Incredibubbles! It’s all happening in our Valentine’s Day update on Thursday the 7th, so not long to wait! Also, and just as excitingly, there are brand new character creation face options! More about that in a moment! Create a character based on the upcoming theme! Let’s get down to business, shall we? ‘Yay or Nay’ mode is in two parts, Create and Vote! Firstly, you get to create a character, based on the upcoming Theme, which is submitted and will be voted on by other players! The Themes last 4 days (Mon-Thurs) and 3 days (Fri-Sun). Now’s a good time to mention the new mouth and eyebrow options at your disposal (unibrow, for example)! Just imagine! Your custom characters will be even more personalised than ever before! Don’t say I never spoil you, Kittens! The second part of ‘Yay or Nay’ mode is that you get to vote for other players’ creations in the current theme by clicking ‘Yay or Nay’ for each character! Does the character fit the criteria? Yay or Nay! The voting continues until the end of the current theme, then the winning characters are announced with super generous rewards for the top entries! Just click View to see the last theme’s winners! OMG! It’s so exciting! Don’t forget, you earn XP and boost your Love Rank just by voting for other players’ characters, and you can vote in up to 30 rounds over the current theme! Hurray! Anyway, Kittens, I hope you have lots of fun creating wacky and wonderful characters for everyone to vote on, especially as there are now new mouth and eyebrow options! I know I will! Ooh! And don’t forget to check out my lovely merch over at mskittypowers.com! 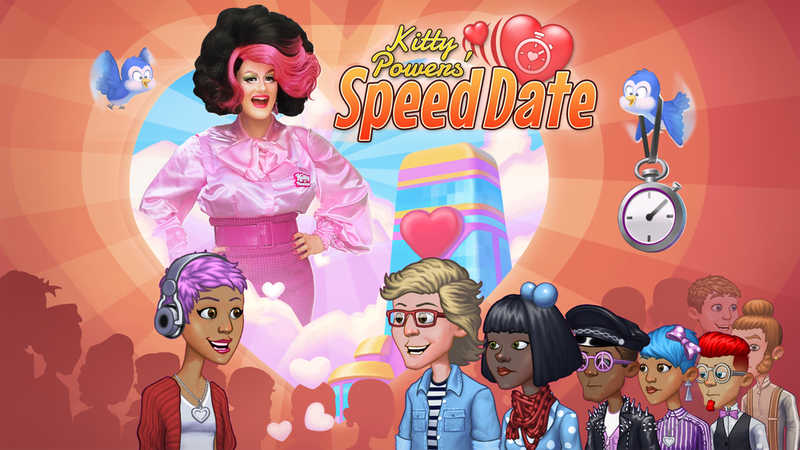 It’s got all the Kitty Powers-related clothing and accessories you’re ever likely to desire! Well, I think that’s enough excitement for one day! I’d better go and have a nice cup of tea, and a sit down in an over-sized comfy armchair! Mmm… over-sized!